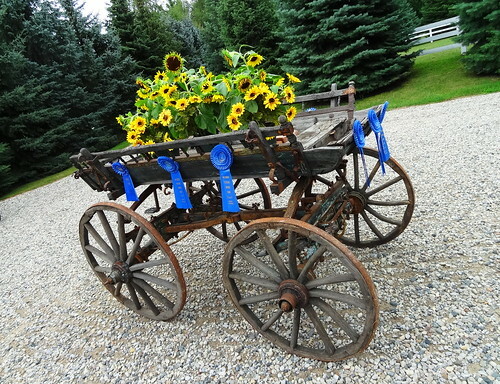 Seldom will we write of an event in back to back years but it’s a perfect day, the sights are fresh and we owe it to this hidden gem to give you another look… We’re about 50 miles north of Detroit, Metamora Hunt Country spans Lapeer and Oakland counties through rolling hills, narrow dirt roads twist and turn through the woods; the south branch of the Flint River meanders past scenic pastures, historic farms and magnificent stables, elegant, statuesque horses roam the land. 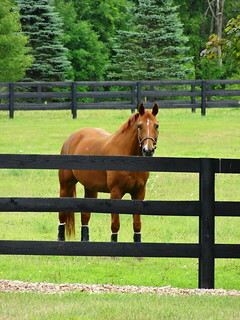 We are attending the Metamora Hunt Stable Tour. 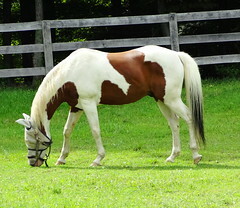 Metamora Hunt was organized in 1928 after the Grosse Pointe Hunt Club and Bloomfield Open Hunt were being pushed out by development of the surrounding land. Mounted fox-hunting has been active in the Detroit area since 1911; it’s full of tradition from the attire to the hounds to the hunt itself. Today we will visit the Hunt Kennels and 7 stables, I have the tickets, let’s go! 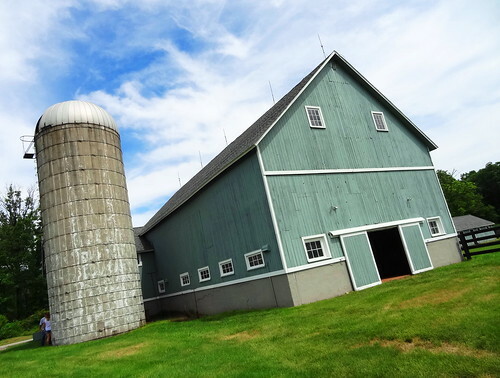 Woodwind Farm is a 300 acre parcel that was once part of the 1,000 acre dairy farm owned by the Booth family (Detroit News, Cranbrook). 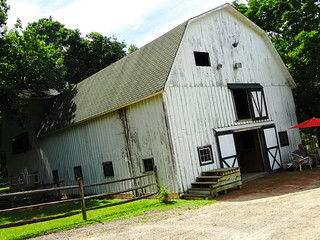 Blue-grey buildings have crisp white trim, the barn was built in 1879 and originally held cows, today horses call it home. 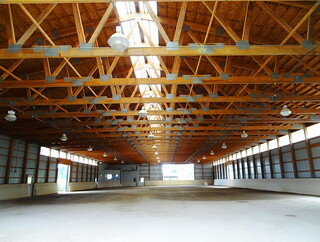 The interior is divided into stalls, dark wood covers the walls and ceiling, the floor is brick. We make our way to the loft, beams are thick and carefully fitted together, the smell of fresh-cut hay permeates the air, we gaze out at the surrounding country, I’m surprised how green everything is after our heat wave. 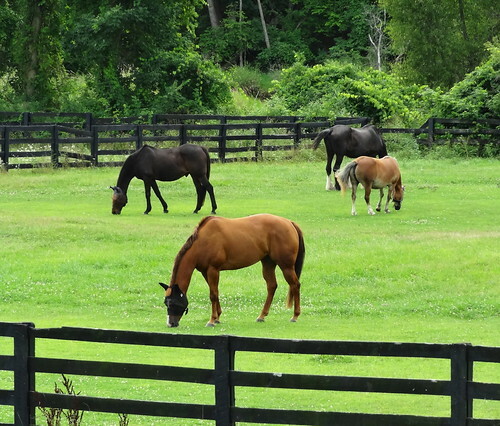 Outside, horses go about the business of grazing, paying no attention to the sudden influx of humans. 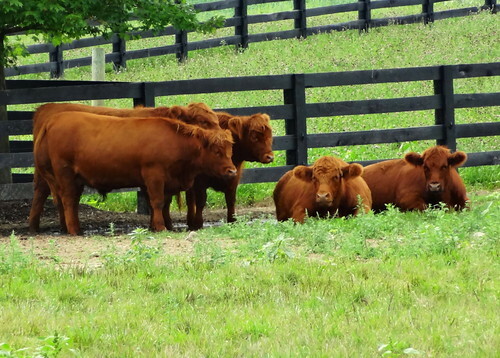 We drive from stable to stable on natural beauty roads, long driveways lead to homes we cannot see, cows and horses wander patches of land divided by split-rail fences. 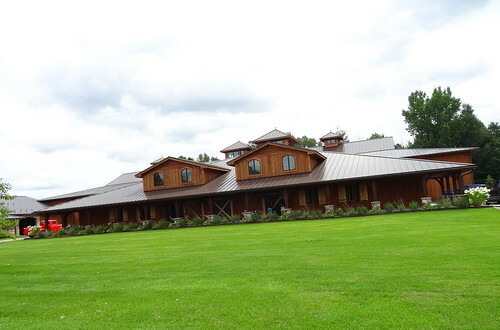 Next to a pretty white house is our next stop, a big, old white barn. The wood-lined interior is divided into stalls, what makes this one unique is the floor made from tree stumps and concrete. 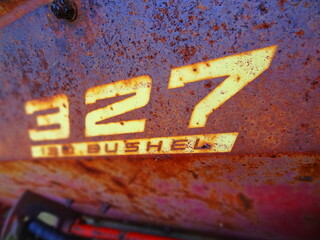 Old farm equipment is resting after years of hard work. 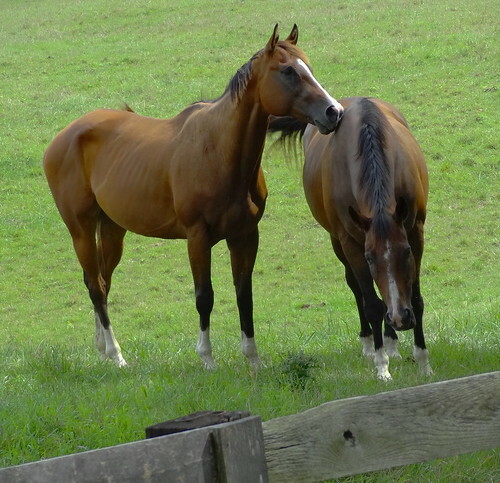 The owner introduces us to her horses, one is over 30 years old. 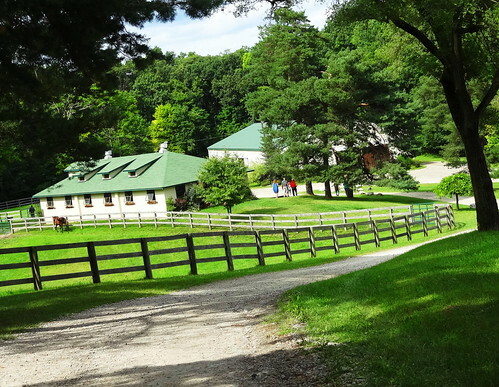 Cheridon Farm takes up 275 acres of hillside and meadow. 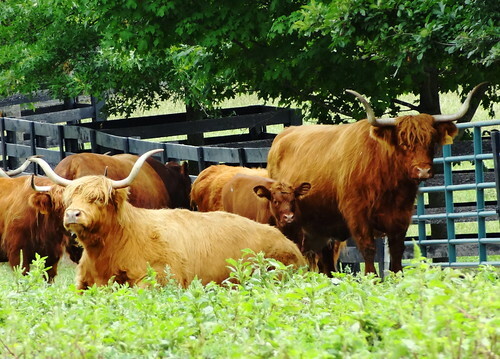 A herd of Scottish Highlander Cattle are clustered together to the left, the guy with the big horns and bangs seems to be checking us out, on the other side the Red Angus don’t seem to notice us. 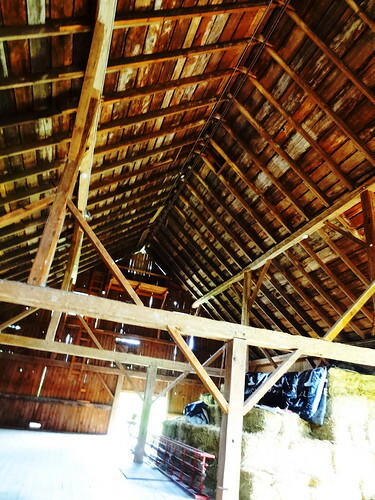 The cattle barn is void of cattle but we do spy a bird’s nest tucked into the rafters, it seems it’s lunch time and mama bird has a trio of hungry babies waiting. 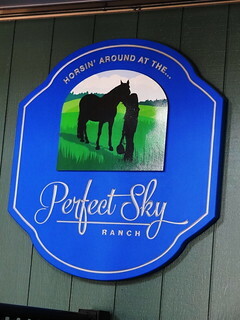 A few roads over we enter a 300 acre equestrian estate called Perfect Sky Ranch. Wow. 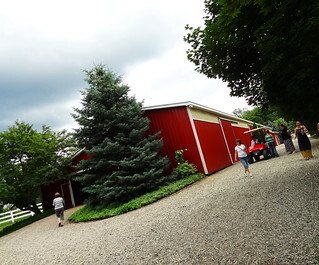 We park near a charming, large wood building with a metal roof, the lawn a deep shade of green, Hydrangea in full bloom. 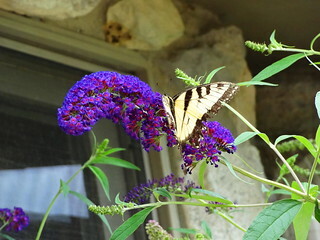 Walking around the property we find ourselves on the patio outside the stable; a waterfall flows into a pond, surrounding planters are stuffed with colorful annuals, butterflies flock to the (aptly named) butterfly bush, the family home is in the distance. We follow fellow tourists to the recently built indoor arena, wow again. 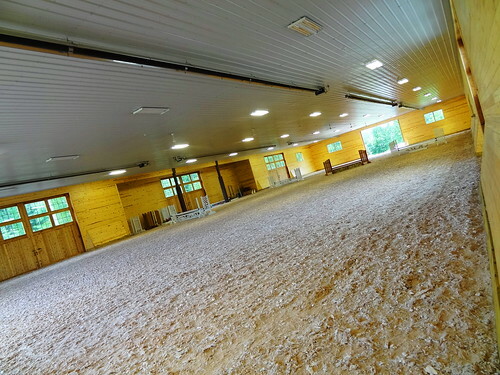 The building is huge, cedar lines the walls, the ceiling white, the footing is a special HT fiber that helps keep down dust, keeping the under layers moist; it’s the softest surface I’ve ever walked on, I’m thinking this is what it would feel like to walk on a cloud…..In addition to Warmbloods and quarter horses, a cool, red, 1956 Ford resto-mod pick-up truck also lives here. 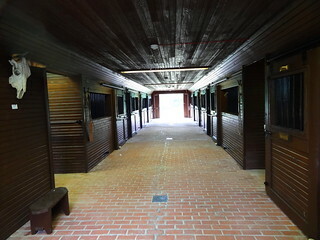 The stable and tack room are quite attractive, as you would expect, horses have an open window in their stall so they can see what’s going on outside. I see one peeking out and take it as in invitation to pet him, he enjoys the attention, I am enamored by his beauty. 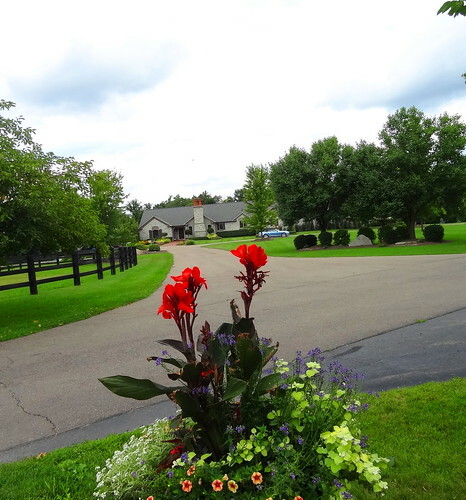 The next farm, White Fences is different from the rest as it is a carriage driving facility. 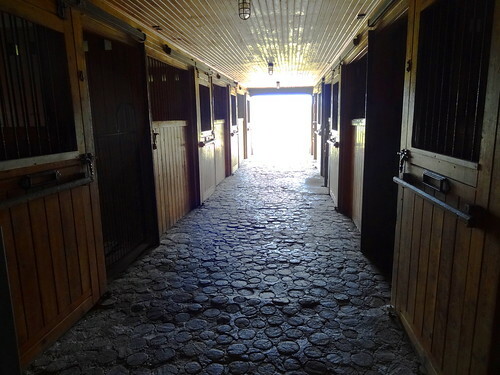 There’s a weekend house, carriage house and a barn with a dazzling tack room. 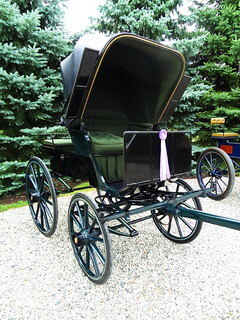 Carriages are parked on a gravel lot, some are open, others covered, they bear ribbons, gloves. 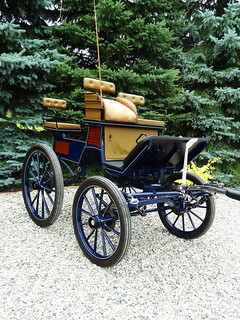 We take a closer look at the antique wooden carriage in the center, a smattering of decorative paint remains, I can only imagine how stunning it must have been. Jim, the owner invites Kris and I to go for a ride on the surrounding trails in his golf cart, and we’re off. 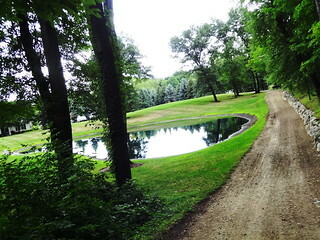 Jim put in all of the landscape and trails you see, the land is absolutely gorgeous; blue spruce, ponds, stone walls. 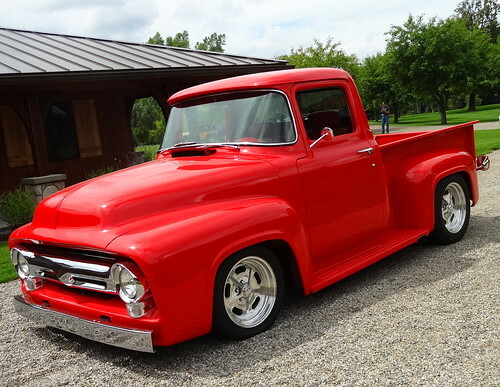 We drive over steep hills, take sharp corners, pass hazards; the trail twists and turns through deep woods and open meadows, picturesque, glorious. 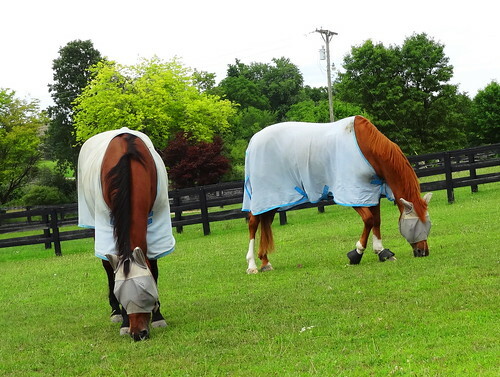 Before we leave we visit with the boys, such handsome ponies! Next we are on a 600 acre piece of land that used to be the settlement of Whigville. 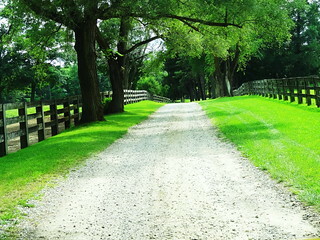 A gravel road takes us through the property, the view is heavenly. 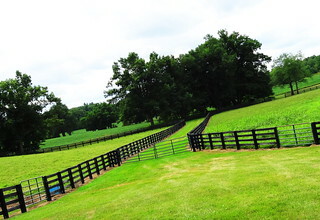 Black fences divide land into sections, there’s an outdoor arena and a 12-stall stable, freshly groomed horses wear coats secured with velcro. It’s such a tranquil setting. 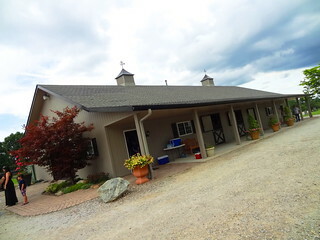 Rattlewood Farms has both an indoor and outdoor arena, they train for both dressage and hunter/jumper disciplines. Fences hug the contours of the land, we stop at the first building, inside the electro-groom waits quietly for its next task, horses are being brought back to their stalls. 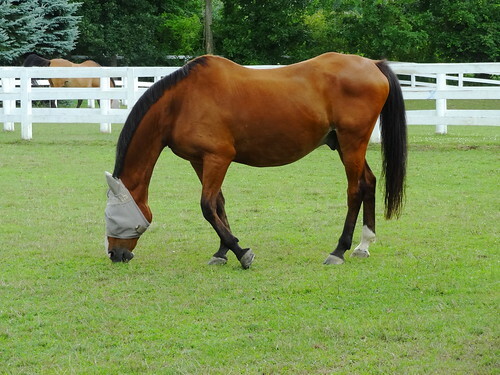 Outside, a young lady is practicing in the ring, her horse wears braids, how fetching. We drive further on stopping at other buildings, horses graze, we pass a group of black cows doing the same. That reminds us, time to eat! The only place to eat after such a divine tour is the White Horse Inn on High Street. 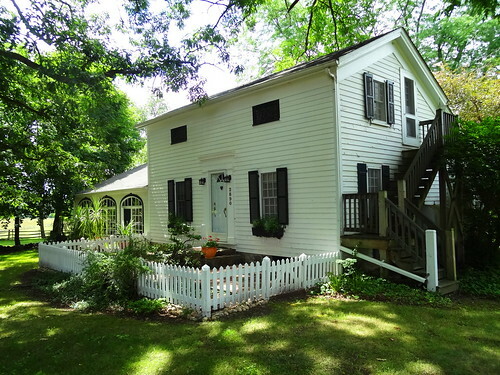 The Inn was founded in 1850 and operated continuously for 162 years. Closed in 2012 for a complete renovation it re-opened in 2014, the new owners have done an amazing job. 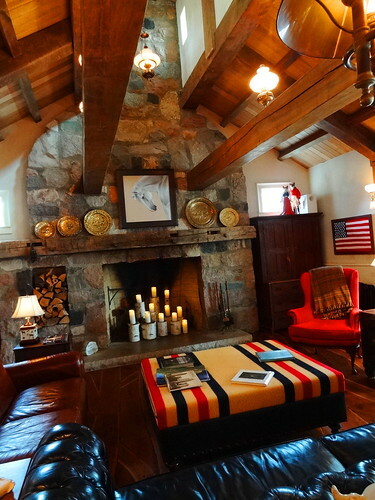 Our favorite place to sit is a little high-top table in the bar area, it has a great view of the fireplace and cozy sitting area which is trimmed out in red, white and blue for the summer. 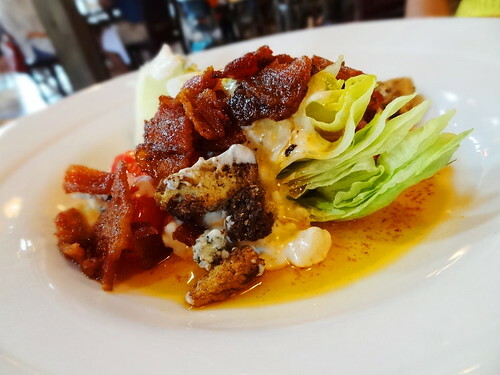 Today we are having the best Wedge salad ever: crisp iceberg, Maytag blue cheese, house dressing and candied bacon, excellent. The BBQ pulled pork sandwich is slow-roasted pork, bourbon BBQ sauce, pickled onions, jalapeno, on an onion roll, delicious. 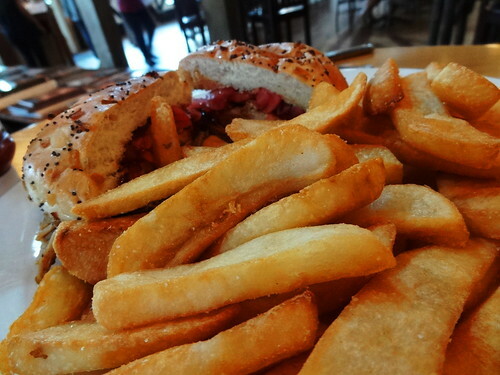 The steak fries are pretty darn good too! We eat slowly, taking in our surroundings, this is the kind of place you like to linger. We have truly enjoyed our time in the country. See ya next year! What a wonderful way to spend a day. I had no idea any of this way so close to home. Thanks for the tour.